Our Office - Mark T. Albers, D.D.S. Our office is committed to providing the best dental care possible for our patients. This is why we use state of the art dental equipment and dental technology to diagnose and treat dental problems. With our E4D system, Dr. Albers can create a dental crown in one appointment. 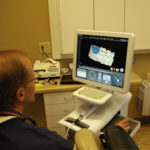 After he prepares a tooth, Dr. Albers takes digital impressions of the tooth with a laser scanner. He then custom designs the crown using the chair-side, computer-based design center, all while patients watch. 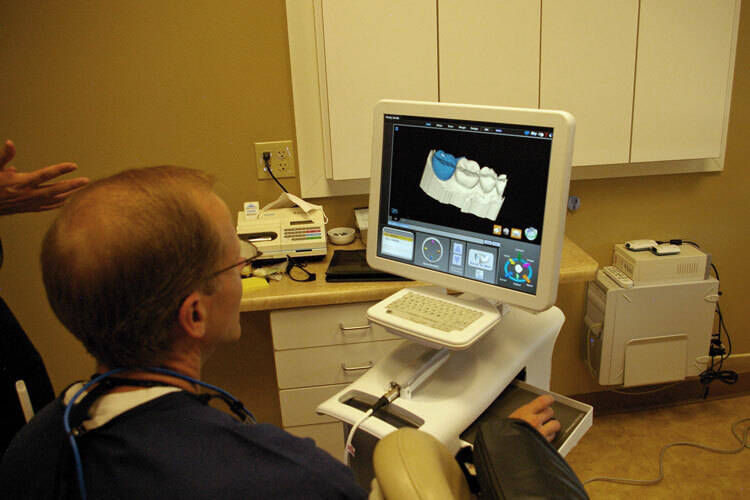 After design, Dr. Albers transfers information about the dental crown to our in-office milling unit. The mill then fashions the crown out of the same materials used by dental labs. Once milled, Dr. Albers checks the crown for fit, adjusts it if needed, then polishes and fires it. Finally, Dr. Albers uses a special adhesive to permanently bond the crown in place. The E4D system allows patients to avoid traditional impression materials, temporary crowns, and also eliminates the need for a second appointment to fit a crown several weeks later. Our digital x-ray units provide instant, high-quality images while reducing the amount of radiation to which patients are exposed. The radiation exposure needed to take a digital image is less than half that of a conventional x-ray film. With this safer, faster technology and patient viewing screens in each operatory, Dr. Albers can review and explain these images to patients during their appointment. Another dental tool Dr. Albers uses is an intraoral camera (a special camera that fits inside your mouth). With this camera, he can project magnified images from inside a patient’s mouth onto a viewing screen. This lets patients see what Dr. Albers sees. Our patients generally find it very helpful and informative when they can see problem areas such as cracked or decayed teeth. The more information we can provide to our patients, the easier it is for them to make informed decisions about their dental care. We value our patients’ time and do not like to keep them waiting! Therefore, we schedule adequate time for each appointment and we notify patients ahead of time how long the appointment should last. We use a sophisticated scheduling system to ensure we are not scheduling more patients than we can adequately see. While circumstances sometimes arise that can cause delay, Dr. Albers and his staff make every effort to begin each appointment on time.